It's Dolphin Awareness Month this month and Springbok Casino has prepared a tribute to these beautiful, highly intelligent marine mammals. 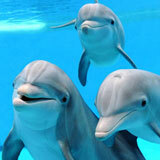 The South African online casino has put together a collection of dolphin stories and videos with interesting and fun facts about these graceful, friendly and playful animals. Free spins on Asgard slot from Realtime Gaming available until March 31, 2018. One video in Springbok’s tribute shows how altruistic these amazing animals can be. All it takes is for them to notice another living being is in trouble and dolphins will rush over to help. Dolphins are skillful athletes but, as another video shows, Spinner Dolphins in particular can perform some astounding spinning jumps. South Africa's favourite online casino has hundreds of games from Realtime Gaming, all played in Rands. A free Android App makes it easier to enjoy them on a smartphone or tablet. Assistance is available in either English or Afrikaans.